I have already shared recipes on how to make Carrot halwa by slow cooking in an open pan and with condensed milk in a pressure cooker. And today I am going to share a recipe of carrot halwa with khova. I have used pressure cooker again as it speeds up the cooking process. For more sweet recipes, please check out the sweet recipes page. Add sugar and crumbled khova now and continue cooking for about 5 minutes..
am craving to have some halwa,makes me drool..yummy! 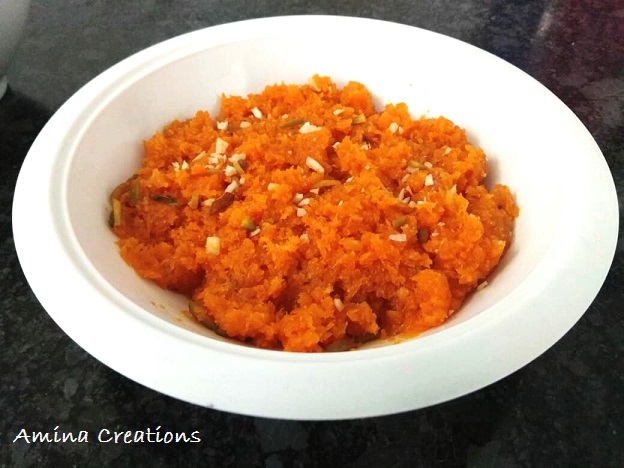 There is so much ways of making carrot halwa... this can never be enough!